A nicely-flavoured bell pepper with fruit measuring about 8 x 10–12cm. The fruit have a beautiful lavender skin surrounding a delicate ivory flesh. As they ripen, they put on an extraordinary show of colours, turning neon shades of yellow and orange before maturing to a deep red. 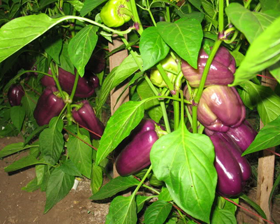 The medium-sized plants are productive and early maturing, and can be grown in containers as well as in the ground. Sow seeds February-May for growing indoors. March-April for growing outdoors. Sow seeds on the surface of a good free draining, moist seed compost and cover with 6mm layer of vermiculite or compost. Place in a propagator or seal container inside a polythene bag at constant 18-21C until germination which takes 10-14 days.